Many of you may remember Alyssa Milano’s terrible experience at Heathrow Airport earlier this year when the security agents made her leave pumped milk at the gate instead of allowing her to carry it with her on her flight. Since then, I’ve been meaning to prepare a “How-To” list for air travel with breast milk. Please note these suggestions apply to domestic travel within the United States. Before you leave for your trip, print out the Transportation Safety Administration (TSA) topic of “Medically Necessary Fluids” http://www.tsa.gov/traveling-formula-breast-milk-and-juice and carry it with you. Alternatively, bookmark it on your smartphone and refer to it as needed. Breastmilk is considered a medically necessary liquid and is exempt from the 3-1-1 Rule, which limits each traveler to one zip-topped bag of one-quart sizes, and the liquids must be less than three-ounces. 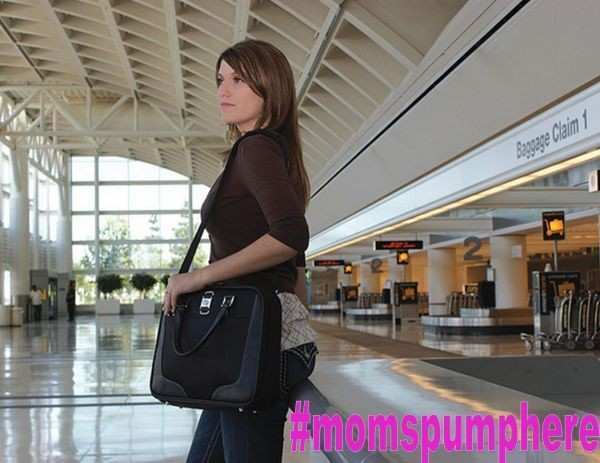 You can pump anywhere you like - in the airport, on the airplane, in the parking lot, in a lounge, in the main waiting area, or in a new high-tech nursing pod such as those at Newark Liberty Airport in New Jersey or in a suite-style room at the Philadelphia Airport. Do not be discouraged that others will notice you or that you may inconvenience someone. You are doing an important job of making milk for your child and nothing should stop you. Bring several zip-top plastic bags with you. You will want to store pump parts in a gallon-sized bag (explained later), and you can store multiple storage bags of pumped milk in one larger bag – because we know you don’t want to spill any of the precious milk! Tell everyone at the airline check-in and at the security checkpoints that you have breastmilk with you. Explicitly state that you intend to bring it on board with you and that you do not want it to be opened. If any of the airline staff or security checkpoint staff opposes this declaration, refer to the TSA guidelines you had researched. Regardless of the airline, the TSA policy should prevail. For example, if you are traveling on American Airlines and the person at the check-in counter indicates you may have trouble getting your milk past the security checkpoint, inform them “I’ve printed out the documents that show I’m permitted to bring this milk with me,” and share the document with him or her. You do not need to put the milk in three-ounce storage bags. If you like, just combine the smaller size bags of pumped milk into one larger gallon-sized plastic bag. The TSA guideline does suggest you travel with only the volume of milk you need – but if you have been away from your child for more than three days and have more than three days’ worth of milk for your child, bring it with you. If you have pumped 50 ounces of milk, TSA should not be able to decide what a “reasonable” amount of milk is. Bring it all with you. Use cooler packs, ice packs, regular bags of ice, or even dry ice if you need to. You do not need to have your baby with you. This unwritten rule angers me. If we had the baby with us, we would likely be nursing the baby and would not need to have the pump or the milk with us! They may check your pump for explosives. This happened to me on a flight from Fort Lauderdale. I was in a rush to catch a connecting flight and I had already gone through security earlier in the day with the pump. I had planned to pump on the plane so I didn’t yet have milk in the coolers or in the pump bag but they whisked away the pump to test it for explosives. Stay with your breastmilk. The security team members may take your bag along with the pump (see #6). If possible, keep the breastmilk with you while they test the pump or ask if you can observe the test from a closer distance. I assume there would be no concerns about this, but keeping the breastmilk, which is food for my child, within my eyesight when it’s being handled by complete strangers seems like the right thing to do. Do not pump in the airplane bathroom. We at Moms Pump Here are trying very hard to keep women from using restrooms to express milk, but please also consider that pumping will likely take 5-10 minutes and you don’t want to disturb the fellow passengers who may need to use the bathroom. You can easily and discreetly pump at your seat – put a pashmina, blanket, or shirt over you while you pump. Store your pump parts in gallon-sized zip-top plastic bags. After you have finished pumping, don’t quickly rush to the restroom to rinse your pump pieces. Simply put them in the storage bags and put them in your cooler pack with the pumped milk. The combination of lower temperature and exposed breastmilk will help them from becoming contaminated until you can rinse the pump pieces when you reach your destination. Be confident. Not everyone knows what a breast pump looks like, or that a woman would want to use one and travel by plane with fresh breastmilk in her luggage. Don’t let this deter you from making food for your baby. You are making the best nutrition possible for your child, and no one has the right to make you feel uncomfortable doing so. Happy Pump Day and Happy Travels. Please share your stories of “Adventures in Breast pumping” on our Facebook page!